Weight-bearing exercise is important for your health, particularly for muscle and bone development. Resistance bands provide muscle-building tension, and can be used almost anywhere. These bands offer safe and effective workouts, and are often recommended by physical therapists for rehabilitation purposes. Resistance bands come in a variety of types, lengths and tensions. Some are flat in composition, while others consist of a tubular band that's often surrounded by a protective material. The latter option comes with handles for gripping, while the former type lacks hand grips. Depending on your specific needs, you can use a band that offers tensions anywhere from 15 lbs. to over 200 lbs. of resistance. Many companies color code their bands to easily distinguish between levels of tension. Like free weights or weight machines, resistance bands provide a force against which your muscles must work. This action causes muscles to contract, which stimulates bone as well as muscle growth. PeerTrainer.com notes that because as you stretch the band the tension increases, bands can, in some ways, be superior to free weights. Johns Hopkins Medicine recommends the use of resistance bands as one of the safest methods to increase bone strength and help prevent osteoporosis. Exercise bands are compact, lightweight and can be used in your home, office or hotel room. They are often used during physical rehabilitation sessions, as they allow the therapist to provide different levels of resistance in a variety of postures and motions that can be modified to suit your specific needs. In contrast, you can perform only a limited amount of movements with free weights or weight machines. Bands provide resistance to just about any motion, and can be especially helpful for athletes. For instance, baseball pitchers can add resistance to their pitching motion, and tennis players can strengthen their backhand with the help of a band. Although resistance bands allow portability and the freedom of movement, these two benefits can also be potential stumbling blocks. Certain exercises and motions require only that you stand on the band, but for other motions you may need to attach the band to a strong, stable surface at a certain height. It may be difficult to find a suitable stabilizing point, depending on your location. Also, the ability to provide resistance to almost any motion can be tantalizing; however, you risk performing the movement incorrectly if you have not been taught proper form. Misalignment can damage muscles, ligaments and tendons, and may cause serious pain. 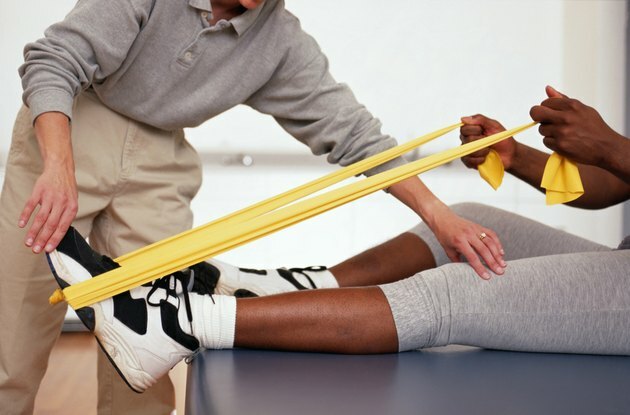 Talk to a certified trainer or exercise physiologist about the use of your resistance bands. Both the flat bands and the tubular bands with handles are easy to store and carry. The handles make certain exercises, like bicep curls and chest flys, easier. Typically, you attach the middle of the band to a stationary object, or stand on it with your feet. However, tubular resistance bands can roll out of place, potentially leading to misalignment in your exercise. Some tube-shaped bands are covered by nylon which has an abrupt stopping point. This stopping point can create a jerking action if you go beyond the band's maximum stretch.